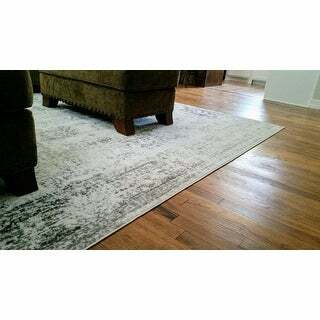 Pad your floors with this durable polypropylene area rug from Unique Loom. The plush pile features a faded grey and white Oriental pattern to complement your vintage decor. Stain and fade resistant, this sturdy carpet is ideal for busy living rooms or bright dining spaces. I’m really happy with this rug. Very distressed looking. The pattern is not symmetrical so you can play around with where you want the darker corners on. Is white and grey in different tones. I wanted something with no color and no beige. This is prefect. Love this rug. Wish I had gotten the next size up so it would cover more of the floor. The color is darker to fading grays and white. Lots of compliments. I searched *** before purchasing this 8x10 vintage looking rug. It arrived in no time at all and it beautiful, soft and comfortable to both sit or walk on. I feel I got the most bang for my buck shopping at Overstock. I also purchased the non-slop rug pad to go under the rug. This rug is perfect for my space! Recommended slip resistant rug product. 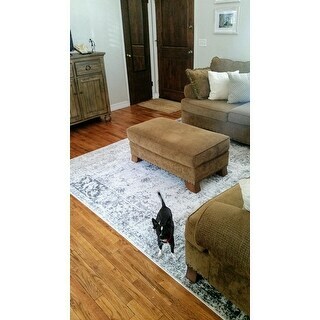 I ordered a second smaller 5X8 rug. An excellent decorative rug to add to my space. Ordered this rug for our living room. The colors are white with light gray fading to dark charcoal. This rug is soft under foot but very thin. If you like thick luxury rugs this isn’t for you. Being thin doesn’t bother me ,for the price I am very happy with the rug. It vacuums well and haven’t had problems with showing dirt. Would recommend this rug. I was very pleasantly surprised by the quality of this rug. It lays down beautifully and the colors are perfect in my dining room. I have not found a need for a pad underneath. Nice rug. Love the faded color. Just very thin rug. 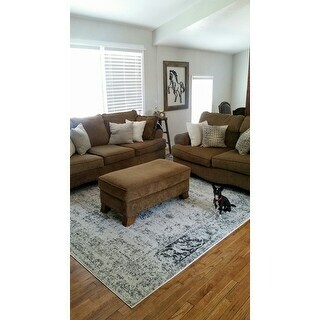 I love this Sofia Area Rug... recommended this rug to a friend who also purchased the rug. I really like this rug. It's a little thin but with a rug pad underneath it should be fine. 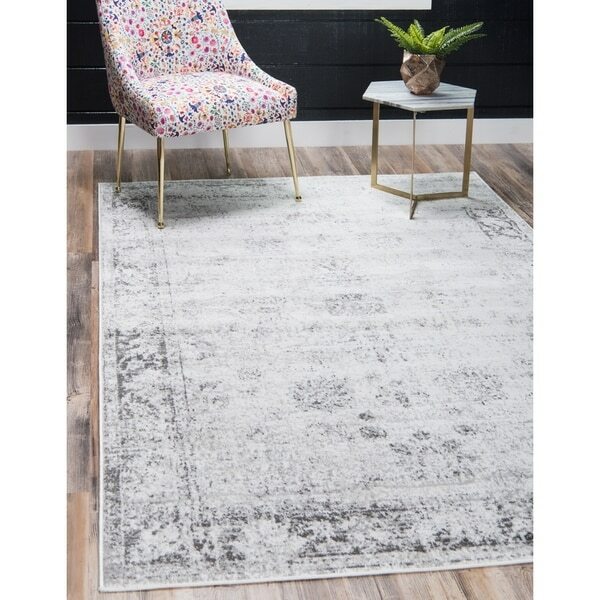 The rug is super soft and the colors work great if you want a light colored rug. So beautiful ! Like. Silver grey! Very shabby chic! Just what I wanted and more! Looks like silk and really soft to sit on and walk across barefoot! Really happy with my purchase!! Love this rug and get so many compliments! Looks Great in person, really pretty Rug! Love this rug! It’s soft and beautiful. The print in the picture is not as obvious in person. 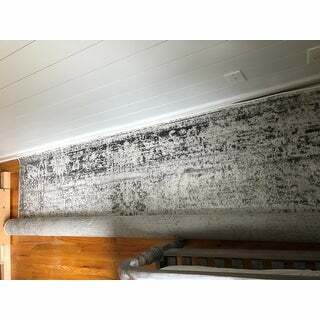 This rug looks amazing in our bedroom. It isn't as white as I was expecting. It's more of a cream or ivory color. Overall I'm still happy with this purchase and would buy again. No issues with unravelling or rolling up on the edges. I've had this rug for months now and not once has it ever laid flat. Not worth it. I love this rug. It took a while to flatten out, but just put some weight on it and it did. 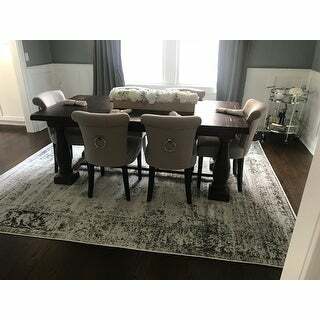 I had purchased the larger version of this rug for my living room a year ago and loved it so much that I had to buy one to match my dining room after my recent move. 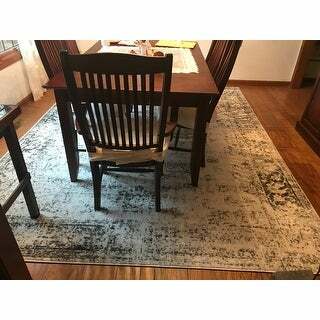 This is a very beautiful and durable rug which receives lots of compliments. This is the perfect size and color for under my round, 48" dining table. The distressed coloring adds softness to our wooden floors. 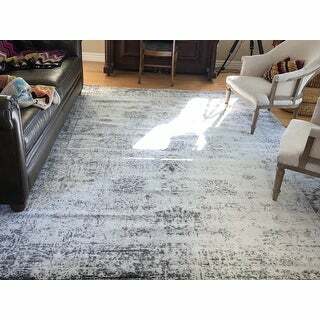 This rug is BEAUTIFUL however it is a little lighter/more white than in looks, that's the only reason for the 4 starts instead of 5. Otherwise thew quality is great and it is very pretty and brightens up the room. I love this rug!! It’s soft but durable. Looks great for the area I purchased it for. 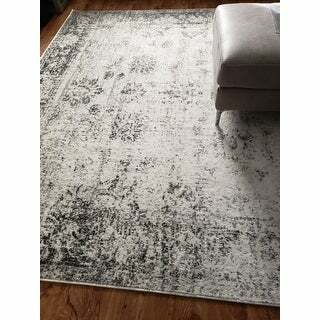 I’ve bought other rugs similar to this one but this one is equally as nice and for a fraction of the price! Very happy!! Love the rug! Nice & smooth, going back to order another size as well. 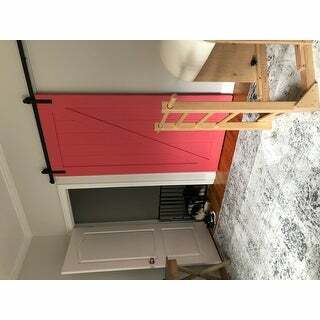 I purchased this for spare bedroom & ended up putting it in our main bedroom! Colors are ver nice. Love Overstock for almost everything!! Prices are out of this world. And coupons. I will be back for all my needs. A must try! So cute, and huge! I really love this rug. It is going to look absolutely perfect in our new dining room. It is very stylish and matches the dining room table we purchased so well. I highly recommend this item. It also has great quality. "The description says this rug is gray and beige. The pictures don't really show beige. What are the colors in person?" "Does anyone else have trouble vacuuming this rug? I have a cordless Dyson and I also just bought a Bissel and neither of them clean this rug well. There is always black specs that come up and are all over the rug. I have babies and I feel like the rug always looks dirty. Any suggestions?" Black specs showing up on the rug is not typical, however we recommend using a light detergent for spot cleaning. Any liquid should be wiped from the rug immediately. "Is this rug dry clean only?" "is this rug white or off white? " White. It's a really nice rug. I put a pad under it. I would say it's more "off white". "does this rug have a matching round? 8x8 or 7x7"
"When is this coming back in stock? I'd like the largest one possible.... Thanks!" "Is the color more creamy/off white or more white?" I would say that it leans more to off white!